The more information you have, the less likely you are to be left behind by the competition. We work hard to keep on top of the latest information, technologies and processes — then pass our learning onto you. With that in mind, here’s a sample of what you’ll find in the learning center. Resources to help you learn more about business marketing, strategies, and business development. Whether you’re a freelance designer, business owner or simply work in-house for a graphic design firm, we’ll be providing you with tips, resources, and template to help make your job easier and your projects look even better. From image enhancements and resolution, color theory and separations, creating production die-lines, to applying print specification, preparing files for prepress and file management — we’ll be covering the topics so you can better understand and learn about print production. Because the better your files are prepared for printing, the less problems you’ll incur and more money you’ll save. Devoted to helping you learn SEO, we dig into search engine ranking and provide easy-to-use tips for professionally optimizing your web pages – even if you’re not a optimization expert. Airport advertising demographics, statistics, and outdoor advertising media types and billboard sizes. 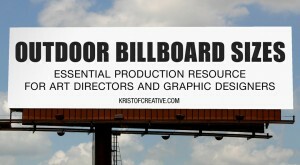 Common outdoor advertising sizes, dimensions, size ratios, and specs for outdoor billboards and outdoor bulletins.